Thursday, November 8th, 6:00 p.m.
2015, Cuba / USA, multiple formats, 65 min + discussion, Coco Fusco in person. Acclaimed artist and writer Coco Fusco will present two recent works in the program Coco Fusco: Cuba Portraits at Conversations at the Edge on Thursday, November 8th at 6:00 p.m. For more than 30 years, Coco Fusco has explored notions of race, identity, and power through video and performance. The program will include La confesión (2015) and La botella al mar de María Elena (2015). Both created in 2015, La confesión explores the public confession of poet and accused counterrevolutionary Heberto Padilla, while La botella al mar de María Elena focuses on the state intimidation of political reformer María Elena Cruz Varela. These portraits examine the relationship of art and artists to our contemporary political moment while charting a legacy of regime power and control over information. VDB TV: Decades Launches Today! VDB TV is a rotating series of groundbreaking programs presenting essential video art, streaming free for the first time to the general public on the Video Data Bank website. From early media pioneers, to sensational contemporary artists, VDB TV provides unprecedented access to the culturally significant Video Data Bank archive of more than 600 artists and 6,000 video art titles. VDB TV is curated by prominent programmers and moving image art specialists. To advance accessibility to the VDB collection, all programs included within VDB TV feature closed captions for the hearing impaired. VDB TV is supported in part by a Media Arts award from the National Endowment for the Arts. To find out more about how NEA grants impact individuals and communities, visit www.arts.gov. Video Data Bank is proud to launch Sympathetic Vibrations: The Videoworks of Paul Kos. This two-disc box set features 25 video works and a 50-page monograph containing specially commissioned essays that expand upon Kos’ five-decade long practice by art scholar Constance Lewallen and SFMOMA’s Curator of Media Arts Rudolf Frieling. 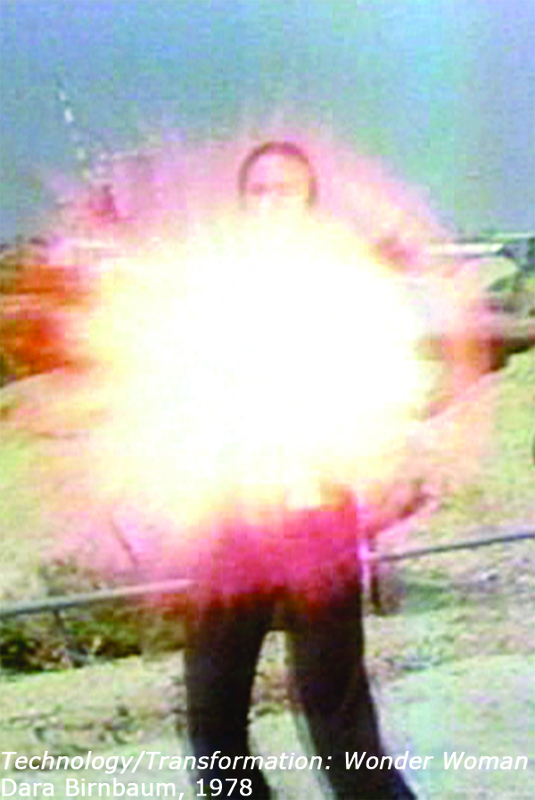 Sympathetic Vibration: The Videoworks of Paul Kos is available for educational purchase. Video Data Bank believes in the unique vitality of our moving image community, a belief that we share with our artists, customers, and partners. As a non-profit organization, Video Data Bank relies on the generosity of individuals like you who believe that video art and artists are worthy of investment. As part of our 40th Anniversary Celebrations we are releasing a selection of limited edition merchandise! These include stylish tote bags, stickers, and buttons to show the world you care about video and media art. We are offering these to VDB donors throughout our anniversary year, but hurry, as stocks are limited! Harun Farocki‘s Parallel IV and Peggy Ahwesh‘s She Puppet will screen as part of Game Play: Artist’s Playing Video Games, November 14th at OFFoff Art Cinema, Gent, Belgium. Ellen Spiro‘s (In)Visible Women is on looped exhibit at the International Museum of Surgical Science, Chicago, November 15th through December 4th, in observation of HIV/AIDS Awareness Month. Cecelia Condit and Leslie Thornton are featured in Stranded at Schwimmen-zwei-Vögel (2), taking place November 16th at the Museum Moderner Kunst Stiftung Ludwig Wien, Vienna, Austria. Feel the Burn: Video Art and Television, screening November 16th at Berkeley Art Museum & Pacific Film Archive, will showcase multiple works by VDB artists including Max Almy, Ant Farm, Dara Birnbaum, Anthony Discenza, and Ilene Segalove. The screening will be presented alongside a conversation between Chip Lord and Steve Seid. November 15th through the 20th, Ursula Biemann‘s Subatlantic will be exhibited as part of the 33rd Kasseler Dokumentarfilm-und Videofest, Kassel, Germany. Basma Alsharif‘s The Story of Milk and Honey and Home Movies Gaza will be screened at the Palestinian Film Festival Australia, November 17th through December 4th. Sadie Benning‘s solo exhibition Shared Eye opens at Chicago’s Renaissance Society November 19th through January 22nd, 2017. You can download the poster for Benning’s exhibition by clicking HERE. Louis Henderson‘s All That Is Solid will be shown at the Departament de Cultura, Barcelona, Spain on November 15th. The Saint Louis Art Museum presents two works by Dara Birnbaum, Technology/Transformation: Wonder Women and Kiss the Girls: Make the Cry, through December 11th. Birnbaum was also interviewed for BOMB Magazine by Barbara Schröder & Karen Kelley. Tran, T. Kim-Trang has released a new digital publication more than meets the eye: the videos of Tran T. Kim-Trang. This publication contains a number of original critical texts, from scholars such as Lucas Hilderbrand and Holly Willis, which were commissioned in 2009 by Video Data Bank as part of The Blindness Series box set. 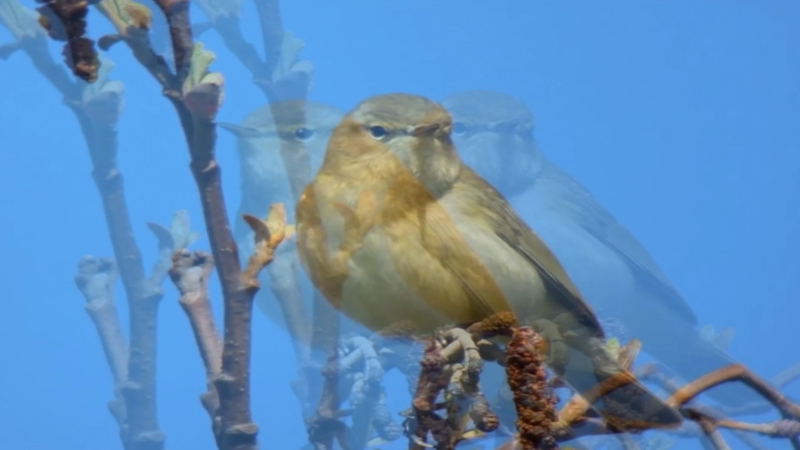 Sara Magenheimer, still from Slow Zoom Long Pause, 2015. Thursday, October 20th, 6:00 p.m. Conversations at the Edge as part of our 40th Anniversary Year celebrations. In her arresting videos, Sara Magenheimer mixes humor and playfulness with a sophisticated inquiry into language and meaning-making. Using visual puns, graphics, and text-to-voice computer programs, her work explores the slippery dimensions of communication. In Seven Signs That Mean Silence (2013), two disembodied computer voices describe in-between places where meaning hides. In Slow Zoom Long Pause (2015), characters meditate on the many ways language fails. 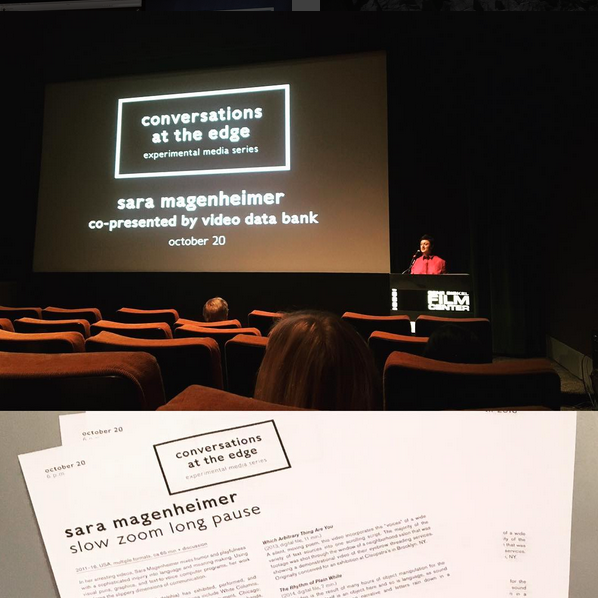 Sara Magenheimer (b. Philadelphia) has exhibited, performed, and screened her work widely. Recent exhibitions include White Columns, New York; Foxy Productions, New York; and Document, Chicago; among others. From 2004–10 Magenheimer performed in bands, touring extensively and releasing five records. She was the recipient of a 2014 Rema Hort Mann Foundation Grant, a 2015 Artadia Grant, and the Prix De Varti at the 2015 Ann Arbor Film Festival. Upcoming exhibitions include Art In General’s New Commissions in Riga, Latvia, and a solo exhibition at the Kitchen in New York. 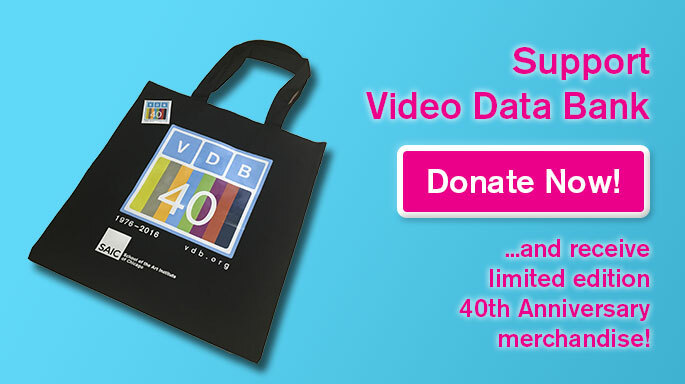 Video Data Bank Celebrates 40 Years of Visionary Video! with our Top Ten Election Season Videos! TVTV’s inside view of the 1972 Republican National Convention made broadcast history. While network cameras focused on the orchestrated renomination of Richard Nixon, TVTV’s rag-tag army of guerrilla television activists turned their cameras on to the cocktail parties, anti-war demonstrations, hype and hoopla that accompanied the show. Irreverent yet poignant, The Eternal Frame is a re-enactment of the assassination of John F. Kennedy as seen in the famous Zapruder film. This home movie was immediately confiscated by the FBI, yet found its way into the visual subconscious of the nation. This tape grew out of Hall’s fascination with Ronald Reagan and his uncanny ability to demonstrate what he called the ‘Signifiers of Americanism’. A satire of the political television spot, Perfect Leader shows that ideology is the product and power is the payoff. A video biography of Segalove’s political involvement in college, of her boyfriend (who became anorexic while dieting to evade the draft), and of her discovery that art could give her a voice and a forum for her political views. Starting with student-recorded VHS footage of two successive Take Back the Night marches at Princeton University, Birnbaum develops a saga of political awareness through personalized experiences. In this irreverent and hilarious videotape, renowned street performer Stoney Burke leads us on a subversive tour of the 1992 Republican National Convention in Houston’s Astrodome. This short video harangue questions land use policy as it serves the oil industry, patriotism as it absolves foreign aggression, and fundamentalism as it calcifies thinking. Political Advertisement depicts the evolution of political ads over the last 44 years, beginning with Eisenhower in 1952 (which was an unqualified success), and continuing up to the most recent ad campaigns for Hillary Clinton and Donald Trump in 2016, coming to Video Data Bank very soon! Political Advertisement IX will screen Friday, November 4th at the School of Visual Arts, NYC. Video Data Bank’s very own Distribution Manager, Zach Vanes, was present at last weekend’s packed Projections program at the 2016 New York Film Festival! He gives us a quick rundown of the happenings at this exciting moving image festival. As part of our 40th Anniversary celebrations we are releasing a selection of limited edition merchandise! These include stylish tote bags (perfect for carrying your VDB rentals), stickers and buttons to show the world you care about video and media art. We are offering these to VDB donors throughout our anniversary year, but hurry, as stocks are limited! VDB TV is a rotating series of groundbreaking programs presenting essential video art, streaming free for the first time to the general public on the Video Data Bank website. From early media pioneers, to sensational contemporary artists, VDB TV provides unprecedented access to the culturally significant Video Data Bank archive of more than 600 artists and 6,000 video art titles. VDB TV is curated by prominent programmers and moving image art specialists from around the world. To advance accessibility to the VDB collection, all programs included within VDB TV feature closed captions for the hearing impaired. Socially engaged artist Suzanne Lacy‘s 18-month project Shapes of Water — Sounds of Hope at Brierfield Mill, Lancashire, UK, receives a warm write-up by Laura Robertson for this month’s Frieze Magazine. VDB artists including George Barber, Kevin Jerome Everson, Louis Henderson, Michael Robinson, and Deborah Stratman are screening works at Experimenta, the artists’ moving image section of the 2016 London Film Festival, October 6-16th. 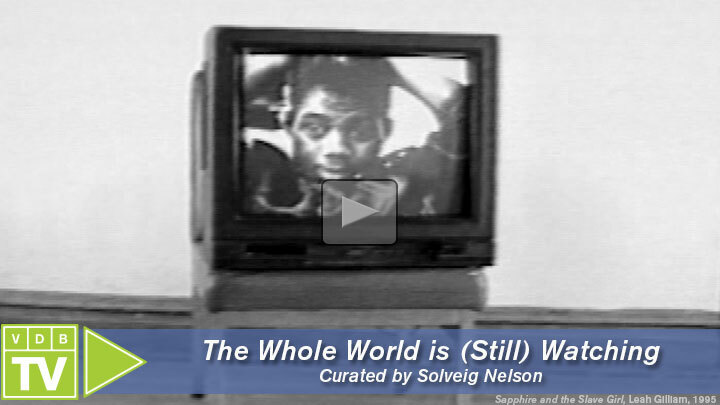 Shelly Silver‘s documentary in complete world will be shown at the Whitney Museum of Art, NYC, and followed by a discussion between Silver and activist Louis Massiah, on the meanings of citizenship in the 21st Century, October 14th. Additionally Video Data Bank is offering this title for free to any interested screening venue until November 8th, contact info@vdb.org for more information. Filmmaker Jim Finn‘s title Chums from Across the Void will screen at the 2016 Vienna International Film Festival on October 20th. As part of the ongoing series Artists’ Film Club at London’s Institute of Contemporary Art, moving image practitioner Dani Leventhal will screen a selection of recent works, followed by a Q&A led by Mason Leaver-Yap on October 27th. Writer and filmmaker Renée Green will screen her video Partially Buried as part of a program that surveys the influence and impact of artists supported by gallerist and patron Virginia Dwan, entitled Of Minimalists and Land Artists, at the National Gallery of Art, October 29th. Berlin-based artist Rosa Barba is currently exhibiting her film Disseminate and Hold as part of an installation at the 32nd Bienal de São Paulo through December 11th 2016. Barba also has a solo exhibit Blind Volumes currently on show at the Schirn Kunsthalle, Frankfurt, through January 8th 2017. 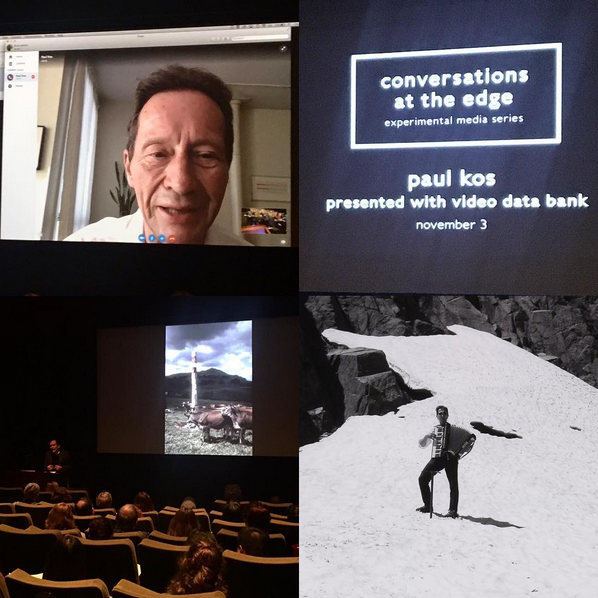 This Fall 2016 Video Data Bank (VDB) celebrates forty years of fostering awareness and scholarship of video and media art. Founded at the School of the Art Institute of Chicago (SAIC) in 1976 — the organization was first located in a closest at the back of SAIC’s Flaxman Library — VDB has since become a leading resource for video by and about contemporary artists. Over the past four decades, VDB has strived to foster awareness and scholarship of media art, long advocating for this most democratic and widely distributed of art forms. To mark this important milestone, VDB is thrilled to collaborate with artists and partners to present an exciting series of special projects and events over the coming months, including artist presentations, box set releases, and the launch of a stimulating new series on the popular streaming platform VDB TV. Don’t forget to like us on Facebook, love us on Instagram, and follow us on Twitter to keep up with the latest anniversary happenings at VDB! Over its forty-year history VDB has grown to include the work of more that 600 artists and 6,000 video art titles. These titles catalog the development of video as an art form from the late 1960s to the present day. During this time VDB has proudly supported countless emerging and established artists, from Lynda Benglis, Bruce Nauman, and Yvonne Rainer to Harun Farocki, Sterling Ruby and Martine Syms. Many of VDB’s relationships with artists, customers, and audiences have their roots in the early days of the organization, a tribute to the passion and conviction of VDB’s founders Kate Horsfield and Lyn Blumenthal. At the Video Data Bank we believe in the unique vitality of our moving image community, a belief that we share with our artists, customers, and partners. As a non-profit organization, Video Data Bank relies on the generosity of foundations and individuals like you who believe that video art and artists are worthy of investment. If you have used the VDB collection to program a screening or exhibition, watched one of our many compilations in a school library, or browsed our extensive online resources to learn about video and media art and artists — we appreciate you and we need your support! Please consider making a donation to Video Data Bank today, whether $50, $20, or $10. In fact if just 10% of our newsletter subscribers were to give only $10 each we would be able to preserve more than 20 historically important works of video art. In any amount, we truly appreciate your gift. Thursday, October 16th – 6:00 p.m. 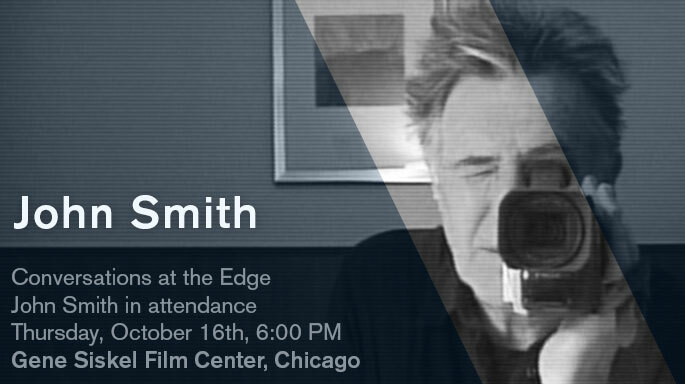 Conversations at the Edge (CATE) is a weekly series of screenings, artist talks, and performances by compelling media artists, organized by the School of the Art Institute of Chicago’s Department of Film, Video, New Media and Animation in collaboration with the Gene Siskel Film Center and Video Data Bank. Thursday, April 24th – 6:00 p.m.
Basma Alsharif’s sharp, seductive films have often been informed by Palestine’s history, its contemporary political situation, and the conflicted experiences of those who call it home (whether or not they live there). She returns to Conversations at the Edge with a collection of recent films that explore bilocation—the act of being in multiple places at once—a state of being she uses to describe Palestinian identity, as well as cinema itself. The program offers the possibility of bilocating through the visceral experience of drone-glitched TV and teenage cello lessons in Home Movies Gaza (2013); a rhyming exercise in the Panathenaic Stadium in Girls Only (2014); a stroboscopic oral history in Farther Than the Eye Can See (2012); and a hypnosis-inducing pan-geographic shuttle in Deep Sleep (2014), a film/performance.